Few directors capture the Midwest as beautifully and poignantly as Jeff Nichols, and almost none of them do so with the same subtlety. His films are about a great many things - the bonds of family, the difficulty of surviving on the lowest rungs of the economic ladder, what it means to be a man - but he weaves these themes into stories that are so compelling that they never feel laboured or complex for complexity's sake. His films are densely layered, yet they also feel guileless. This is especially true of his third film, Mud, which might seem minor in comparison to the apocalyptic menace of his previous film, Take Shelter, but is no less powerful for its smaller scale. Set in a small town near the Arkansas delta, Mud is a coming-of-age story built around the experiences of a young boy name Ellis (Tye Sheridan) who one day goes out with his friend Neckbone (Jacob Lofland) to investigate a small boat that he has found in a tree. The two intend to make the boat their own clubhouse, but soon discover that someone is already living in it. That someone is Mud (Matthew McConaughey), a fugitive from the law who is hiding out on the island until his girlfriend Juniper (Reece Witherspoon) can join him, at which point they'll sail off into the sunset together. Touched by Mud's story of a love that can surely conquer anything, Ellis agrees to help him by bringing supplies to the island and passing messages to Juniper. It isn't long before Ellis' role as a go between brings him into contact with some very shady characters who are after Mud and for the man's story to become a little bit more complicated than it at first appears. Even though it is undeniably a modern film with a contemporary setting, there's a timelessness to Mud that is rare and special. Strongly reminiscent of the works of Mark Twain and Charles Dickens - with McConaughey as a sort of chiseled Magwitch - it feels like the latest addition to a long and illustrious tradition of stories about young men going on an adventure, only to be rudely ushered into adulthood along the way. As much as the film is about Ellis' efforts to help Mud reunite with Juniper and stay ahead of the people on both sides of the law who are pursuing him, it is primarily about how Ellis uses his quest as a way of evading the slow break up of his parents' marriage. Mud and Juniper's relationship is, in his mind at least, the sort of romance that demonstrates that true love really does exist, and the power of the film lies in seeing how the various strands of the story come together to dissuade Ellis of that notion. It's also this element of the story that is the most disquieting since the women in Ellis' life are often portrayed in a less than flattering light. His mother (Sarah Paulson) is presented as the one who is breaking up the family, Juniper is an ambiguous figure at best and Ellis' young girlfriend (Bonnie Sturdivant) comes across as incredibly fickle and manipulative. That's not to say that women have to be portrayed in a positive light all the time in fiction - film noir would be a painfully dull genre if that was the case - but there are times in Mud where it seems as if most of the male characters have some shading and complexity while all the women are one-dimensional. However, what's important to note is that this is not necessarily the view of the film, rather the view of its male characters, who often have highly partial reasons for being distrustful of women. Ellis' father (Ray McKinnon) talks about them as manipulative and snakelike, which is only to be expected considering that his marriage is falling apart and that would engender tremendous bitterness, and Ellis' view of his girlfriend is entirely coloured by his own naivete. By the end of the film, each of the female characters is afforded the same complexity and shading that the males are thanks to the journey that Ellis himself goes on. By the end he no longer views the world in simple terms, and neither does the film. One of the greatest things about Mud is the way in which Nichols balances his interest in these small, intimate slice of life vignettes with the demands of the central crime story. Though much of the film is devoted to depicting Ellis as a boy on the cusp of adolescence, full of excitement and forever fighting against the complications of the adult world, it manages to seamlessly integrate those elements into a story that climaxes in a wonderfully staged gun battle without making the two seem at odds with each other. Part of the reason why that balancing act is a successful one lies in the elegance of its structure, which never allows the audience to lose sight of the mystery surrounding who Mud is and what he has done, but also the performances, which are excellent across the board and make all the characters feel grounded and real. McConaughey continues his recent run of tremendous form, investing Mud with both a childlike innocence and a sense of danger, like a majestic yet menacing animal always on the verge of striking. But Nichols has also assembled an incredibly deep bench of wonderful character actors to support him, including his regular collaborator Michael Shannon in a very funny role as Neckbone's uncle, and really did well to land two supremely entertaining and engaging actors for the two young leads. 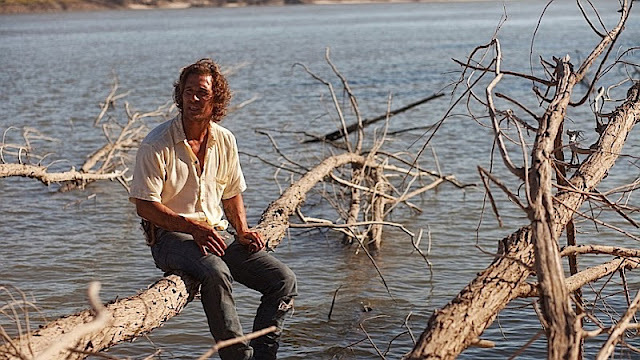 Although the sexual politics get muddied at times, though at least for reasons that emerge from the story, Mud is another wonderful film from Jeff Nichols, who can now legitimately claim to be one of the best young American filmmakers currently working. By turns funny, tense and sweet, it's a prime slice of Americana with none of the corniness that entails. It's gritty without ever being dour, simple without ever being simplistic and light without being inconsequential. It might be a minor masterpiece, but the second half of that phrase is more important than the first.